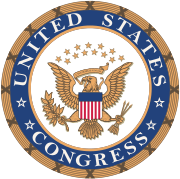 The Congressional Arts Caucus is a registered Congressional Member Organization for the US House of Representatives in the 115th Congress. The Congressional Arts Caucus was created in the 1980s as a way for the various members of Congress interested in the arts to be able to influence art legislation and to promote the National Endowment for the Arts. Ann Kirkpatrick (AZ-1)- Retired from the House in 2016. Lois Capps (CA-24)- Chose not to run for reelection in 2016. Mike Honda (CA-17) - Lost re-nomination for 2016 general election. Loretta Sanchez (CA-46) - Retired to seek a U.S. Senate seat. Patrick Murphy (FL-18) - Retired to seek a U.S. Senate seat. Alan Grayson (FL-9) - Retired to seek a U.S. Senate seat. Brad Ashford (NE-2) Lost reelection in 2016. Louise Slaughter (NY-25)- (Democratic co-chair) Died on March 16, 2018. ^ "Congressional Arts Caucus" (PDF). Congressional Arts Caucus. Retrieved 26 November 2016. ^ "Caucus Membership". Retrieved 20 October 2017. ^ "Representative Lois Capps Announces Retirement". New York Times. 8 April 2015. Retrieved 6 May 2017.